Efficient biopharmaceutical process development relies on the Quality-by-Design (QbD) paradigm. QbD is a scientific, risk-based proactive approach to drug development that aims to have a full understanding of how the process and product are related. This knowledge is gained by process analytical technology (PAT). In this case study the Applied Process Company (APC) integrated external PAT and an APC-developed controller with an Eppendorf DASGIP® Parallel Bioreactor System. 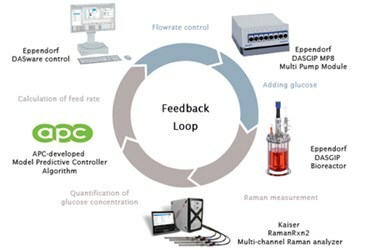 Online PAT measurement and control of the identified critical process parameters led to greater understanding and the streamlined optimization of a mammalian cell bioprocess. The study exemplifies the value of flexible bioreactor systems which allow ease of integration of third-party technology.